Spen Victoria hosted last season's Heavy Woollen Cup Final between Hanging Heaton and New Farnley. 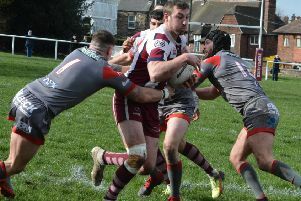 Woodlands have been paired at home to Huddersfield League Premiership champions Hoylandswaine in the Solly Sports Heavy Woollen Cup first round, to be played on Sunday April 21. Woodlands overcame Hoylandswaine in the 2015 and 2017 Heavy Woollen Cup finals, while the Huddersfield League side suffered an unwanted hat-trick of final defeats when they ere beaten by New Farnley in 2016. Holders Hanging Heaton begin their defence with a trip to Huddersfield League side Shelley, while last year’s beaten finalists New Farnley entertain minnows Crossbank Methodists. Elland, who have re-entered the competition in 2019, have been paired at home to Gomersal, while Birstall face a trip to former Central Yorkshire League rivals Townville. Farsley enter the competition for the first time in 2019 and have been handed a tasty tie against fellow Bradford Premier League side Wrenthorpe. Ties to be played Sunday, April 21. First round: South Kirby v Woodlands, Shepley v New Farnley.